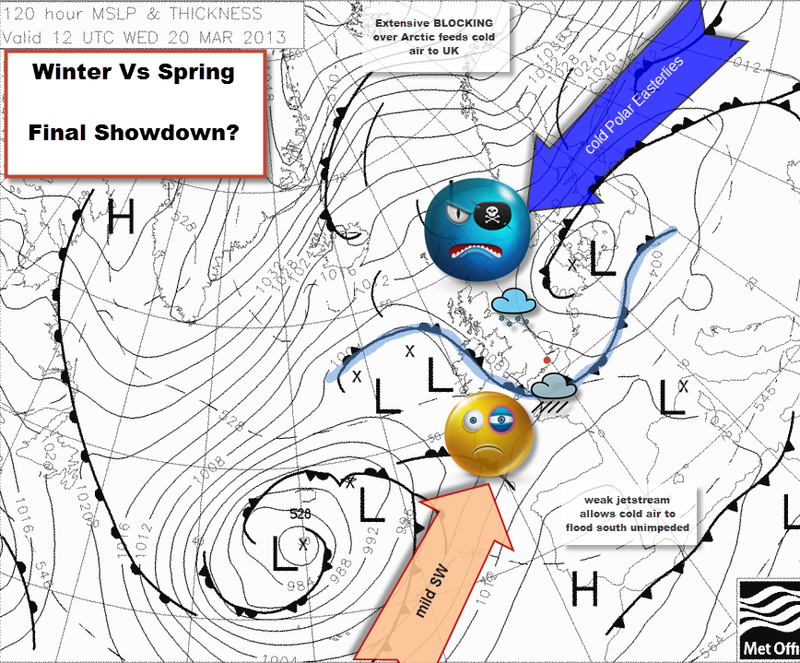 2013 Winter Vs Spring: big show-down playing out this week! She’s old and her weather fronts have broken-up into a wild chaotic spiral but she’s due to deliver a powerful kick in the teeth this week! Yes, the cool “Polar” LOW bringing heavy rain and miserable conditions to Reigate this weekend is due to edge slowly south and east Monday-Wednesday next week. This will, once again, open the door for North Easterly winds to swing across the country and pull temperatures well below Spring averages, just 3-4°C max by mid-week. Snow is most likely up North where temps are lowest but in Reigate temperatures will still drop low enough for an increasing risk of rain turning to sleet and snow any time from Monday on. The nature of this complex old LOW pressure means forecasting precise rain/sleet/snow fall is tricky at the moment as numerous troughs and lines of showers circulate around the edge but expect a miserably cold week with rain, sleet and snow at any time and especially Tuesday and Wednesday when upper air temperatures fall lower as North Easterlies kick-in properly. On the bright side, the winds will be lighter than last week so wind chill is less extreme. Milder air may make a push towards the south east mid-week which could bring a more significant snow risk Wednesday if it runs up against the cold air but this is uncertain at present. Sunday forecast: rain most of daylight hours; moderate & heavy showers at times esp pm; temps 5ºC. and falling in the afternoon with slight risk of sleet later as temperatures fall away behind the showers. HEADS UP: OUTLOOK FOR THIS WEEK … MARCH = the new JANUARY! 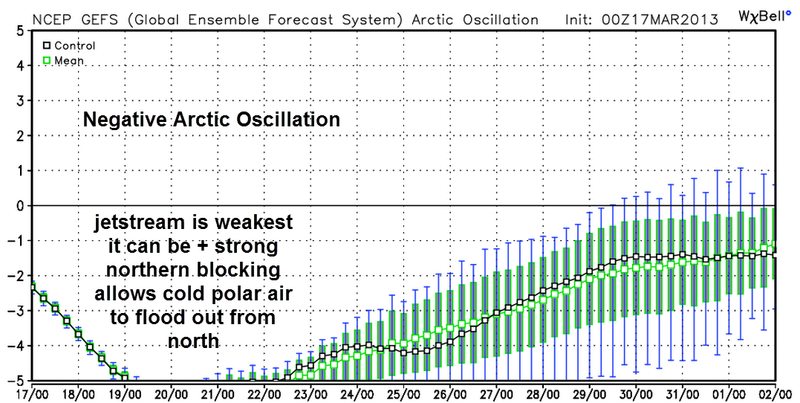 see below: Extremely negative Arctic Oscillation threatens continuation of cold March weather this week.